A Phoenix television station’s “Candid Camera” caught Arizona Republicans eating $70 steaks and drinking bourbon while schmoozing with ALEC lobbyists. 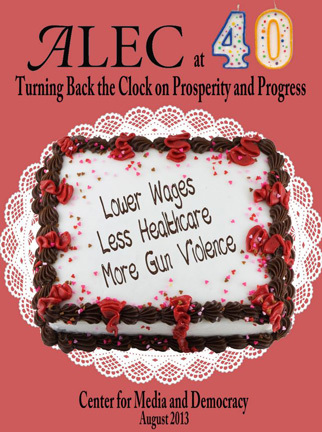 Check out the TV news video here and listen to Arizona Representative and ALEC Chair Debbie Lesko explain how great ALEC is. With a tip and assistance from ProgressNow Arizona, KPHO-TV 5 News aired an eye-opening hidden-camera investigation Tuesday night that reveals how the American Legislative Exchange Council (ALEC) wines and dines Arizona politicians to advance its right-wing corporate agenda. KPHO investigative reporter Morgan Loew crashed a lavish back-room ALEC recruitment dinner attended by at least 17 Republican state legislators at one of the finest chop houses in Phoenix. ALEC is an out-of-state right-wing corporate bill mill that has wielded heavy influence in Arizona and at state legislatures around the country. In addition to Shooter and local ALEC chairwoman Rep. Debbie Lesko, Arizona lawmakers spotted at the dinner included Senate President Andy Biggs Reps. Eddie Farnsworth, John Kavanagh, Carl Seel, Brenda Barton, Bob Thorpe, David Livingston, J.D. Mesnard, Justin Olson, Michelle Ugenti, T.J. Shope, Adam Kwasman, Jeff Dial; and Senators Nancy Barto, Chester Crandell and Don Shooter. There were no Democratic lawmakers seen at the event. Best legislature that money can buy.